Very nice house on quiet and cozy street and good connections to the city. The house has newly renovated kitchen & bathrooms. It's a modern and nice kitchen with exit to the garden. Livingroom has a open area toward the dining room which fits the whole family for nice dinners. The garden has a grill, sunbeds, sofa and nice furniture's for long days in the sun. The garden also has a trampoline and a playhouse for the kids. A nice house next to a national reserv very close and with excellent communications to the city. A nice garden and the sun location of the house is perfect, you have sun from Morning until sunset on the terrace. On the top floor you have the master bedroom and the kids bedroom (which sleeps one adult plus one kid). You also have a playroom and a newly renovated bathroom with shower. On the main floor you have a large hall, newly renovated kitchen, a Livingroom with a fireplace and a dining room that has room for 8 people. You rent almost the hole house, the house in the garden is closed and one small room in the basement. Parking lot next to the house for 2 cars. If you have any questions, just give me a call or send me a message and I´ll do my best to help you! There are also several playgrounds around the corner. Distance to Central station in the middle of the city is 8 km, and if you walk to Södermalm where the city center begins it´s about a 5 km walk. The subway takes 15 minutes to central station from Kärrtorp. The closest metro/subway station is Kärrtorp about 15 min walk from the house, but there is also buses 100 meters from the house that takes you to the subway station. Södermalms is where you find a lot of artists, new designers, small restaurants. 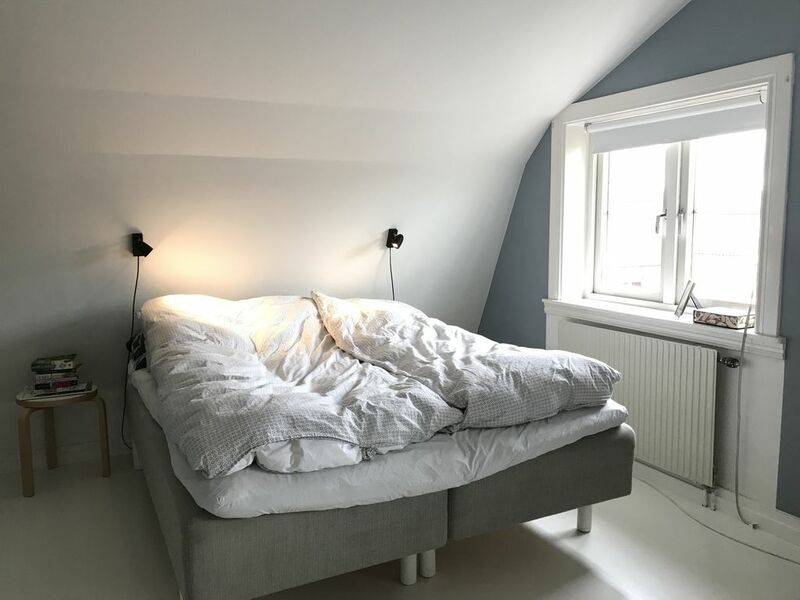 It´s not the fanciest part but very nice and cosy. Just a few hundreds of meters away from the villa you find Nackareservatet, a national reserv where you can have long walks or go for a run in the forrest and on prepared tracks. The closest metro/subway station is Kärrtorp about 10-15 min walk from the Subway/Tube. If you go by taxi, check the prices before, there is a compare price for 10km that should be not more than 340:- (a big yellow sign on the outside of the car), I guess it cost around 600:- to go from Arlanda to our house with taxi. (A bigger car for more than 4 passengers cost a little bit more thou). There are also both train (Arlanda Express) and buss coaches (Flygbussarna) to central Stockholm. From central station it's easy to commute by subway & bus to the house. Around the corner you'll find the national reserv Nacka reservatet, very nice for long walks and/or running. 200m away you'll find the Unesco World Heritage Skogskyrkogården, The Woodland Cemetery, in Stockholm Sweden. It's very nice for walks, Skogskyrkogården is beautiful all year round, much due to the unique way it is woven into the landscape. The cemetery never closes, so you can easily access the World Heritage when you prefer, throughout the year. You'll also find a garden cafe in the neighborhood. 100m away from house you'll find buses that take to the subway station, either kärrtorp (bus 180) or Gullmarsplan (bus 816). You can also easily walk to the subway stations Kärrtorp or Skogskyrkogården in 10-15 minutes. from there the subway takes around 10 minutes to city center. If you prefer to walk it's approximately 5 km to walk to Södermalm. Taxi to/from södermalm should be around 200 SEK, remember to use big taxi companies "taxi Stockholm", "Taxi Kurir" or "Taxi 020". You can ofcourse use UBER as well , then you will know the price. The guests has access to all areas except the house in the garden and one small basement room. If you'll need any help, wonder anything about the house or want any tips during your stay i'll be available for questions and i'll do my best to help you. A family father who loves life! We love our home, still so white and peaceful and right outside of the city puls.